Get yourself out into the supine position (Supine Position) as you have for previous ball exercises and as illustrated in the picture below. Put your arms at your sides pointing toward your knees. Use your abdominals to pull your shoulders up and reach toward your knees with your hands. Visualize the distance between your rib cage and your pelvis as shortening as you do this. Once you master the ab crunch on the floor you can make it a little more difficult on the ball. 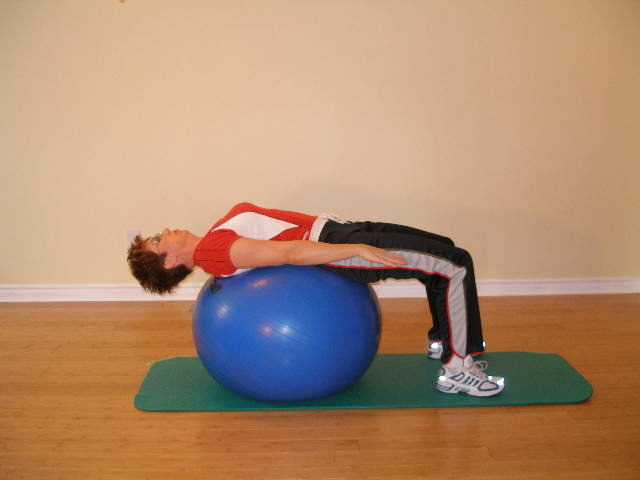 The exercise ball allows you to crunch through a larger range of motion. This exercise is made easy by having your arms pointing toward your feet. As your elevate your arms your weight is shifted making it more difficult as in the Ab Crunch 3.